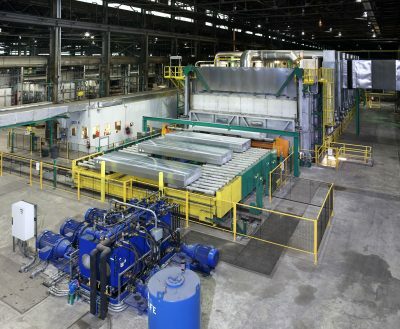 EBNER Furnaces is a global market-leader in the manufacturing of heat-treatment furnaces used in the metals industry. Founded in Austria in 1948 with additional locations in China, India, and the U.S., Made in Medina County met with General Manager, Herbert Gabriel and Phyllis Caynor, Human Resources and IT, to learn about what they do here in Medina County. Q: Could you please share some of the history of EBNER Furnaces? A: The company was formed in 1948 in Austria to supply industrial furnaces to the metals industry. This is still our headquarters and largest facility, where we have our R&D lab to do testing of the designs we build. It was another 30 years before we gained our first customer in the U.S., and almost another ten once we opened the plant here in Wadsworth. Its original purpose was customer service, but we quickly realized the benefits of manufacturing close to our customers and over time added design, build, and installation services as well. In 2004 a plant was opened in China to build, install, and handle customer service for their region. We have a smaller operation in India that was opened in 2009 for primarily customer service in that region. The company is still privately owned with Robert Ebner being at the helm. Q: With headquarters in Austria, how did the company decide to open a facility in Wadsworth? A: We wanted an operation state-side that could service customers here, since obtaining our first U.S. customer in 1978. The owner was nearby visiting a customer in Orrville. The rural landscape and rolling hills reminded him of Austria. It was also close to cities and had the infrastructure in place to get our large furnaces onto the highway system. 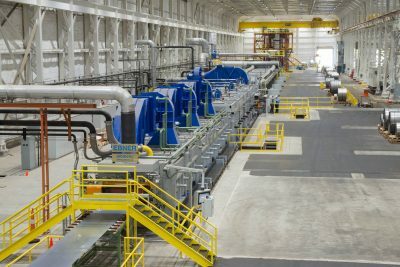 With a lot of metal manufacturers located between Chicago and Pittsburgh, this was right in that corridor; central to customers. So we built in Wadsworth and opened in 1987. Q: When we say “furnace”, I tend to think of what’s in my house. How do your products differ? A: Our furnaces wouldn’t fit in your house, and some rival the size of a football field. They are used to heat treat large amounts of metal so it can be pressed into a sheet or formed other ways. The bell annealer is the most common of our furnaces, but we also make pushers, roller hearths, floaters, and batch-types that use extremely high convection and special gases such as hydrogen. So you see our furnaces are much stronger, powerful, and hotter than what you have in your house. Q: What industries do you work with to provide furnaces? A: Our customers are typically suppliers to the aircraft, automotive, packaging or construction industries and process steel and aluminum. Due to the high standards set forth for parts in those industries, they require the highest temperature uniformity, reproducibility, and reliability from our equipment. Q: What do you do for the automotive industry? A: Just as one example, our furnaces are used to form the body parts on the Ford F-150 trucks. In this case the material goes through our furnace twice. 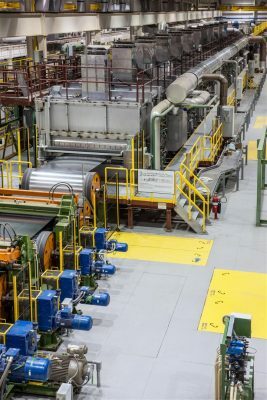 The first furnace preheats large 20t slabs of aluminum so that it can be rolled to the exact thickness required for the component. 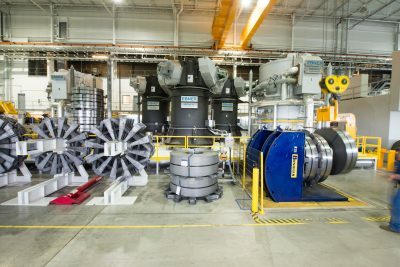 The heat treatment in the second furnace makes the aluminum sheet much stronger and it floats on an air cushion so it does not come in contact with any part of the furnace. This is done to keep from damaging and scratching the material. You don’t want someone looking at the finished vehicle and seeing even the slightest scratch underneath the paint. You may not realize it, but the F-150 is by far the best-selling vehicle in the world, and it is very important that every one of them looks perfect. Q: Being so far removed from the end product, how do you do R&D? A: We do something we call roadmapping. We spend time with our customers discussing what their needs will be five years down the road. By listening to them, we can start our R&D, find solutions, and build the equipment. As their requirements change, we adjust our plans to accommodate them. So it may take five years to get the furnace from the thought-stage to production. We enjoy taking on challenging projects. It allows us to be more in tune with our customers, react to their special needs, and be better than our competitors. Q: Everyone is having challenges finding employees. What strategies do you employ to help with that? A: We offer a state-certified apprenticeship program which is a four year training program our employees can go through to learn more about manufacturing. It is all paid by EBNER and at the end they have a certification recognized by all companies in the state. We’ve had apprentices in many different departments including quality assurance, welding, and manufacturing. We work closely with local high schools and the Four Cities Compact to inform and train students for a career in manufacturing. We target students who are unsure of their career path and may not be able to afford school or training post high school. A couple times a year we offer tours so they can see first-hand what it’s like to work here, and get them interested in the opportunity of working in manufacturing. Q: What about your current team? A: We currently have 87 employees with a busy workload. EBNER is a great place to work and all our team members are dedicated to provide great products and services to our customers. We care for our employees and do a lot for them, for example our annual summer picnic. Of course safety is very important to us. We take a proactive approach and bring in safety consultants, the BWC and EPA regularly to be sure our facility and equipment are safe for everyone. Q: How has your industry changed? A: When the company started, we would take just about any furnace work that came along. We did things well, but it was hard to be the best at every furnace type. Since then we specialized on certain areas in which we have a clear goal to be the industry leader. Now, the best jobs for us to take on are the thorny, difficult projects. We love to solve the problems and meet the real challenges of day-to-day business. Q: Which is why the story is called, “Challenge Accepted”! A: Exactly. Our products are to a higher standard and solve problems, and with our wide range of service offerings, we supply more than just a product. A: Customer satisfaction is extremely important to our success, and with that comes great customer service. A furnace may last 30, 40, 50 years but when it isn’t working properly, we need to be able to fix it quickly and efficiently. A recent addition to our service offering is through digital technology that allows the customer to show us the problem in real time. They literally wear a helmet with a camera, headphones, and specialized goggles so our engineer here in Wadsworth can diagnose the situation and get to a solution quicker. For more information on Ebner Furnaces, visit the company’s website.